The Dufour 412 has twin helm stations designed for short handed sailing, but has a cockpit with bags of space to accommodate numerous members of crew without feeling crowded. The wide side decks, expanded swim platform and uncluttered deck ensure both safe, ease of passage and good looks. Internally the Dufour 412 Grand Large has all the features you expect from Dufour, plus some new ones! The navigation table seating converts to increase the seating capacity; the redesigned companionway adds both increased security and light to the accommodation area. 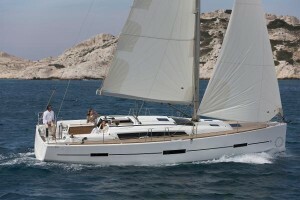 The Dufour 412 has been short listed for European Yacht of the Year 2014 in the ‘family cruiser’ category. Winners will be announced in October.